What happens when life imitates a movie? That's the question Sarah Sundin must have been asking herself as she set the plot line for the first book in her newest series "Wings of A Nightingale." In With Every Letter, Sundin builds a relationship with Lt. Mellie Blake and Lt. MacGilliver by mimicking the Jimmy Steward movie, "Shop Around The Corner," by developing an anonymous "morale-building" pen-pal effort between soldiers and nurses. For Tom, the chance to write the letter, gives him a way to escape into anonymity and develop a friend without the burden of his infamous family history. Millie, on the other hand, feels trapped in a quagmire of shyness. She believes she's unable to escape her painful childhood and develop a friend. She is coerced into joining the letter writing campaign by a overzealous and slightly romantic supervisor. Through a flurry of letters, the pair begin building an amazing friendship - but it falters (and almost ends) when their postings put them both in Algeria. Can they move beyond the anonymous names of "Annie" and "Ernest" and actually meet? Both need to move past the fear of potential rejection, in order to find out if their friendship - and potential love - can move beyond the pages of their letters. 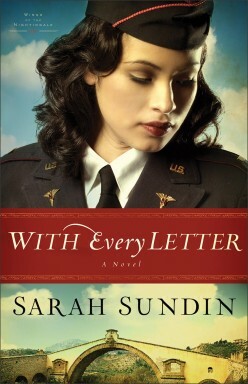 Not only Sundlin's book explore a piece of history that is interesting - the use of flight nurses in World War II, but it reminds us of a bygone time with the letter-writing exchange and how people used to cherish the written word. This is the second series I've had a chance to read by Sundin. You can tell (it's listed in her bio) that her novels are inspired by her great-uncle who was a pilot during WWII. Both series focus around nurses and pilots - in different ways. I picked up this novel after a long week, and I'll be honest, only because I had agreed to read it. Boy, am I glad I finally let myself relax long enough to check it out. I found a novel that was well written (duh, already knew that from her previous books), well researched (yep, she continues to have quality, historical research embedded in her novels) and a storyline that I truly enjoyed. Sundin's writing style is friendly, soothing and well, just fun. I felt like I could identify with both Millie and Tom - in a variety of ways. The characters seemed real - and I found myself wanting to keep reading to find out what happened. In other words, I quit feeling tired, and simply enjoyed losing myself in a quality novel. On the scale of one to five, I give this novel a four - and recommend it. If you enjoy reading World War II based novels - or novels about nurses - I think you'll really like this book. You'll probably also find yourself wondering what comes next (the other two books in the series). 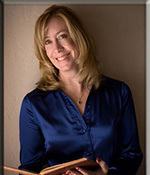 Sarah Sundin received the 2011 Writer of the Year Award from the Mount Hermon Christian Writers Conference, and her second novel A Memory Between Us is a finalist for an Inspirational Readers’ Choice Award. Her stories are inspired by her great-uncle who flew with the U.S. Eighth Air Force in England during World War II. Sarah lives in California with her husband and three children. ”With Every Letter” eReader Giveaway and 9/27 Facebook Party! Enter today by clicking one of the icons below. But hurry, the giveaway ends on September 26. Winner will be announced at the “With Every Letter” Author Chat Facebook Party on 9/27. Connect with Sarah, get a sneak peek of her next book, try your hand at a trivia contest, and chat with readers just like yourself. There will also be gift certificates, books and a Book Club Prize Pack to be won (10 copies for your book club or small group)! Don't miss a moment of the RSVP today. and increase your chances of winning. Hope to see you on the 27! You are absolutely welcome. I really appreciate how you captured Millie's shyness. I truly identify with her in more ways than I like to admit..lol... The story has "stuck" with me and I've thought about it several times in the last few days. Thank you again, for a well written novel.